For anyone who tracks work that goes through stages or categories, Kanban reports let you visualize your data in cards that are easily moved between categories. For example, in a Sales Manager app your sales team can view their opportunities organized by funnel stage. Then they can drag an opportunity card from one stage to another as the opportunity progresses. The columns in a Kanban report are based on values in a single-select multiple choice field or a user field. In our Sales Manager app example, the multiple choice field is called "Stage." Each time you drag an opportunity card to a new column, you change the value in that "Stage" field. From the Table bar, choose a table that has a single-select multiple choice field or a user field. Note: You will only be able to create a Kanban report if you have a single-select multiple choice field or a user field. 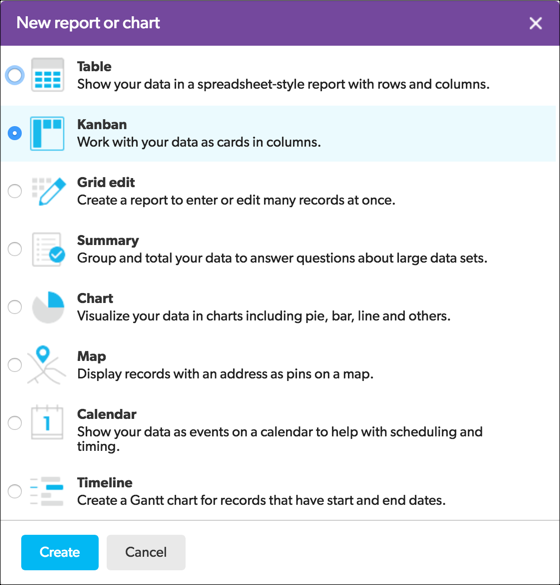 Click Reports & Charts to open the reports and charts panel, then click +New. Select Kanban from the list and click Create. In the Reports & Charts panel section, determine who can see this report listed in their panel. You can also choose to organize the report into an existing group in the panel. In the Card Groups section, select the multiple-choice field or user field you want to use to group your cards into columns. For example, in your Sales Manager app, you can select the field called "Stage" to see your team's opportunities categorized by where they are in the sales funnel. You can choose to show up to 10 groups. So if you your sales funnel has 15 stages but not every stage is relevant for your users, you can select the 10 you want to appear in your report. Note: Each group will display the first 50 records as cards on your report. In the Card Details section, you can customize the three fields you want to display on your cards. Otherwise, the cards will display the first three fields from your default settings. In the Filters section, you can customize the data that displays. You can set initial filters to include only relevant data and also define dynamic filters that enable users to change the display to quickly get just the view of data that they need. Read more about using filters. For example, to customize which opportunities from your table appear in your Kanban report, add an initial filter. In the Sorting section, select the field to determine the order you want the cards to appear within your columns. If your app admin has enabled manual ordering for this table, you can choose to let users determine the vertical ordering by dragging cards within columns. More about manual ordering. To color-code your cards, select Color-code cards using a formula. More about color-coding.